Beyond the identification of the most appropriate cells and scaffold materials, translation of cardiovascular tissue engineering structures requires optimization of construct biological and mechanical properties in order to permit their long-term functionality in the native hemodynamic environment. Unfortunately, rudimentary tissue growth technologies such as plate or rotisserie culture do not lead to the generation of functional tissues, thereby limiting their usefulness. Dynamic culture systems or bioreactors with true construct mechanical conditioning capabilities thus form an essential part of the research and development pathway in cardiovascular regenerative medicine. This is because engineered tissues cultured under specific bioreactor mechanical environments enhance their biological properties such as functional stem cell differentiation to complex tissue phenotypes and also augment construct structural properties as a result of accelerated tissue formation. In the heart valve tissue engineering arena, based on at least a decade of scientific results, there is now general acceptance that bioreactor usage is a critical preclinical step. 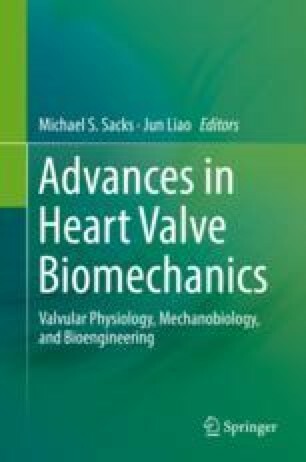 In this book chapter, we describe important considerations in bioreactor design as well as focus on the critical scientific findings in the development of de novo valvular tissues, including our own experience in this area. We subsequently detail scaffold and cell sources that have been used in conjunction with these devices and finally conclude by addressing the key challenges that still remain.